Lantana is the ideal plant for desert gardeners who think they can't grow anything. These plants flower and thrive in even intense heat. 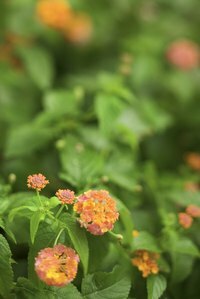 A woody, flowering ornamental that remains close to the ground, lantana has a number of uses, from ground cover to bedding plant. Lantana is hardy to zones 9 and above on the U.S. Department of Agriculture Plant Hardiness Zone Map. Outside of the plant's hardiness zones, start lantana seeds indoors three months before temperatures in your region rise to 75 degrees Fahrenheit. Harvest the seeds when the small, green, berrylike seeds turn from green to deep purple or black. Spread the seed capsules on a layer of newspaper in a cool, dry area. Allow them to remain until they are completely dry and turn crinkly and shiny. Seeds can be soaked and planted immediately or stored in an airtight container. Place the seeds in a bowl and cover them with hot tap water. Allow the lantana seeds to soak for 24 hours before planting them. Sow the lantana seeds 1/8 inch deep in a combination of equal parts moist peat moss and vermiculite. Cover the pot with plastic wrap. Set the germination pot on a heat mat set to 75 F. The seeds require bright but indirect sun. Lantana seeds germinate erratically so don't give up if they don't sprout right away. They may take anywhere from 14 to 120 days. Remove the plastic wrap when the seeds sprout and allow the pot to remain in indirect sun. Keep the soil moist until you transplant the seedlings into the garden. Wait until temperatures reach 75 F to transplant the lantana into a sunny garden spot. Some hybrid lantana produce sterile seed. Grown from seed, the resulting lantana plant may not be the same color as the parent plant.